WINNER OF THE CHILDREN'S BOOK OF THE YEAR AT THE NATIONAL BOOK AWARDS 2018 & THE SUNDAY TIMES NUMBER 1 BESTSELLER___________'This book can save lives. More often than not, these are the role-models boys encounter in the books they read at home and at school. As a boy, there is an assumption that you will conform to a stereotypical idea of masculinity. But what if you're the introvert kind? What if you prefer to pick up a book rather than a sword? What if you want to cry when you're feeling sad or angry? What if you like the idea of wearing a dress?There is an ongoing crisis with regards to young men and mental health, with unhelpful gender stereotypes contributing to this malaise. It is an extraordinary compilation of 100 stories of famous and not-so-famous men from the past to the present day, every single one of them a rule-breaker and innovator in his own way, and all going on to achieve amazing things. Entries include Frank Ocean, Salvador Dali, Rimbaud, Beethoven, Barack Obama, Stormzy, Ai Weiwei and Jesse Owens - different sorts of heroes from all walks of life and from all over the world. A beautiful and transporting book packed with stories of adventure and wonderment, it will appeal to those who need the courage to reject peer pressure and go against the grain. 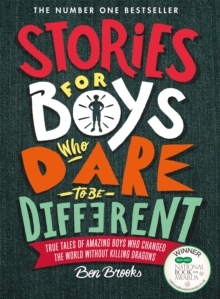 It is the must-have book for all those boys who worry about stuff and all those parents who worry about their boys who worry about stuff.